There are two levels of service a consulting firm can perform on a group pharmacy benefit plan: review and audit. In truth, many plan sponsors believe they're buying an audit when in fact they're receiving only a review. Because the identification of risk is vastly different between the two consulting services, plan sponsors and their agents should know the differences. The problem is that a review provides only limited assurance and is substantially narrower in scope when compared with an audit. A review does not include an investigation of the plan sponsor’s internal control system or its risk of excessive overpayments, which could be an area of interest for CEOs, CFOs and plan administrators. 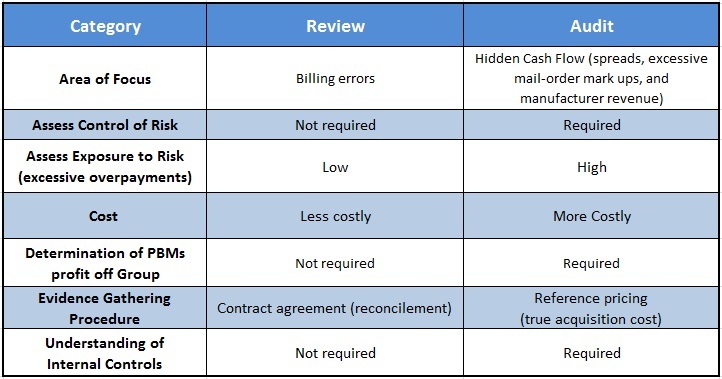 A review does not use true acquisition cost reference-based pricing. For the most part, a review checks for contract compliance. 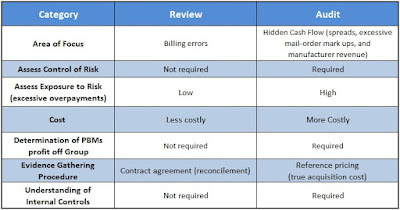 Errors found during a review are likely just billing mistakes and don't account for all risks. Risk is measured by exposure to overpayments. 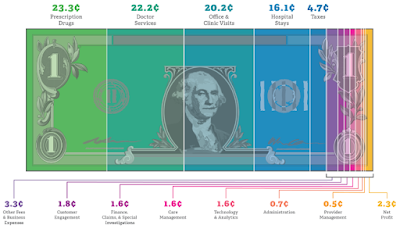 A review costs less than an audit and, as a result, is often viewed as the preferred option (see figure 1). Reviews disclose overpayments related specifically to contract terms. It does not help to disclose payments over AAC (average acquisition costs) or withheld manufacturer revenue which the PBM retains as a service fee or hidden cash flow. The lesson here is that a company should hold an in-depth discussion in advance of the consulting firm’s initial engagement to ensure that there is sufficient value in performing a review, or determine whether a different option would be better fit. Ultimately, a review is a very effective option for companies that are comfortable with the limited assurance given in the report. Obtain an understanding of the client company’s internal controls and assess hidden cash flow (paid) risk. Corroborate figures and disclosures included in the final report by obtaining audit evidence through inquiry, physical inspection, observation, third-party confirmation, examination, analytical procedures and other procedures. The audit is usually substantially higher in cost than a review. However, the evaluation of risk (overpayments) is more substantial compared to a review. When plan sponsors can account for PBM service revenues they make better decisions about their pharmacy spend. 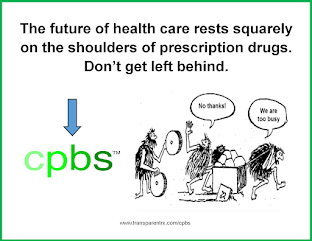 In addition, they will discover the key to cost-containment in the pharmacy benefit is primarily mitigating the PBMs profit not the pharmaceuticals. Some might bark at this notion but keep this in mind. Offering a pharmacy benefit is inherently expensive thus the key is not to overpay. Groups achieve this by making sure they benefit more from the PBMs buying power than the PBM itself. Choosing an audit or a review is mainly a question of your needs and the needs of your stakeholders. Should cost be considered? Yes, but it should not be the driving factor unlike the choice for a PBM vendor. Proper planning and discussions with your cross-functional team should yield the right decision for your company – one that will fulfill your needs in the most cost-effective manner.